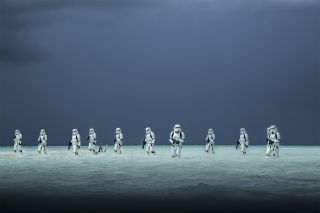 Stormtroopers in the new Star Wars film "Rogue One" wade through the water of an alien ocean world. NASA scientists believe ocean worlds exist in our own galaxy, along with many other environments. Thousands of exoplanets have been discovered outside of the solar system, including some that might resemble the icy, desert and water-covered worlds that are seen in the fictional "Star Wars" universe. Using NASA's Kepler space telescope, astronomers have discovered a Saturn-size planet called Kepler-16b, which is located 200 light-years from Earth and orbits two suns — just like Luke Skywalker's home planet of Tatooine. Because of this striking resemblance, astronomers nicknamed the real-life exoplanet "Tatooine." The alien planet Kepler-16b has two suns just like the fictional planet Tatooine in the "Star Wars" universe, home of Luke and Anakin Skywalker. See how the planet's twin sun setup works in this Space.com infographic. Desert worlds like Jakku from "Star Wars: The Force Awakens," also exist within our universe. Mars, for example, is a cold and arid planet with the potential to support life. "The recurring theme of desert worlds in 'Star Wars' is really interesting, because there is some research that shows that these would be likely habitable worlds to find," Shawn Domagal-Goldman, an astrobiologist at NASA's Goddard Space Flight Center in Maryland, said in the statement. "The lack of water on a desert planet might be what makes it more habitable. Water amplifies changes to climates and can cause planets to end up being really hot like Venus, or really cold like Europa." Europa is an icy moon of Jupiter that resembles the snow-covered fictional planet Hoth, where the Rebel Alliance's Echo Base was set in "Star Wars: Episode V - The Empire Strikes Back." Below Europa's frozen surface lies an ocean of liquid water that could potentially host life. In fact, NASA is currently planning a mission to Europa to explore this region of the icy Jovian moon for signs of extraterrestrial life. However, the most important component to sustain life as we know it is water, and scientists have yet to confirm that ocean worlds like the fictional planets Kamino, from "Star Wars: Episode II - Attack of the Clones," and Scarif, from "Rogue One," exist in our universe. Discovering such aquatic worlds may be possible in the "not-so-distant future," NASA officials said, explaining that ocean glint — or bright light reflecting off a planet's watery surface — can be detected from afar. "In the 'Star Wars' universe, [George] Lucas and company envision scores of worlds bustling with intelligent beings. In our galaxy, we know of only one such world so far — Earth. But NASA exoplanet scientists think we have a fighting chance of finding life beyond our solar system," NASA officials said in the statement. "The next few years will see the launch of a new generation of spacecraft to search for planets around other stars." This includes the Transiting Exoplanet Survey Satellite (TESS) and the James Webb Space Telescope — which will examine the atmospheres of other planets — as well as the Wide Field Infrared Survey Telescope (WFIRST), which is expected to launch in the mid-2020s and will be used to capture images of exoplanets around sun-like stars. "The idea of life on other planets resonates with people on a very personal level," Doug Hudgins, NASA's program scientist for exoplanet exploration, said. "They [the 'Star Wars' films] portray this image of a universe that is teeming with life."